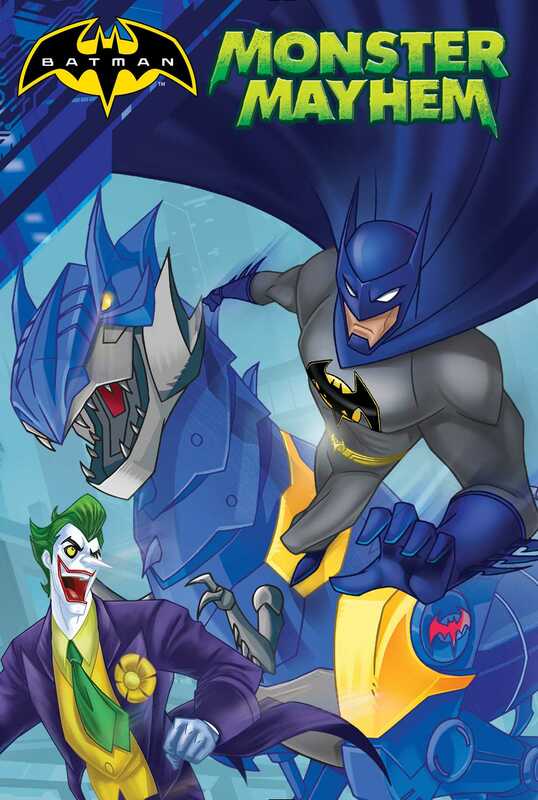 Team up with Batman, the Green Arrow, and more of your favorite heroes as they battle the Joker and his evil crew in this action-packed novelization that includes an eight-page full-color insert with stills from the Batman animated film, Monster Mayhem! It’s Halloween night in Gotham City, and the streets are full of monsters—real ones! Batman is battling a crime spree being carried out by the spookiest villains in town—Scarecrow, Clayface, Solomon Grundy, and Silver Banshee—who are all secretly working for the Joker. The evil mastermind wants to unleash a computer virus that will make all technology cackle and obey his every command! The Joker thinks he’s in for a Halloween treat, but Batman has a trick up his sleeve: his pals Green Arrow, Cyborg, Nightwing, and Red Robin are joining him to fight back! Can they save Gotham City before it’s too late? Find out in this novelization that includes eight pages of full-color stills from the Monster Mayhem Batman animated film! On the outskirts of Gotham City, high atop a hill, stood the dark and foreboding institution known as Arkham Asylum. It took a special type of criminal to end up at Arkham. Within the asylum’s walls were some of the most dangerous foes ever to fight Batman, villains who were too dangerous and sometimes too insane to be held in regular prisons. It was Halloween night, and the stillness surrounding Arkham was abruptly disrupted by a loud crash. It was the sound of a giant fist crashing through a wall of the asylum building! Bricks fell to the ground as Solomon Grundy used the sheer force of his body to smash the rest of the way through, creating a huge, jagged hole in the side of the building. Standing seven feet tall and weighing 517 pounds, the zombielike Grundy had been one of Batman’s strongest and most dangerous enemies, and now the asylum’s exterior wall was the only thing that separated him from the innocent people celebrating Halloween in nearby Gotham City. And he wasn’t alone. “Come on!” he yelled behind him as he ran toward the concrete wall that stood between him and the outside world. The sorceress Silver Banshee stepped through the hole, her long white hair whipping in the wind and her dead eyes blinking in the moonlight. Silver Banshee possessed superhuman strength and the power to create a sonic boom just by using her voice. As soon as she was free from Arkham, she was going to seek revenge against the heroes who had imprisoned her. She caught up to Grundy, who was already pounding his massive fist against the concrete wall. He quickly knocked a gaping hole in it, and the two villains stepped through. Solomon Grundy and Silver Banshee quickly disappeared into the woods before anyone even knew they had escaped.